On the 22nd of March we arrived in Singapore and spent three days at the Raffles Marina in order to get the yacht ready for a long sailing trip to Bali. Vito had left the boat and Piotr was the new skipper. After the short break in Singapore I couldn’t wait to be back on the sea again, and it was a good feeling when we finally started our engine and steered out of the marina. But then it happened. After a couple of meters, still in the marina, the engine died. We barely managed to dock the boat on another free spot. It’s not easy to do that with a 10 tons yacht and no engine. Then we tried to start the engine again, but there was no chance. The engine was broken. Well, from now on the mechanic told us pretty much every day that the engine would be fixed the next day. Eventually he admitted that they were waiting for some spare parts. And after stalling us for over two weeks, he admitted that they hadn’t even ordered the parts yet. And that it would take them another 2 weeks to fix the boat. Then we finally made the right decision and went to another repair shop in town. 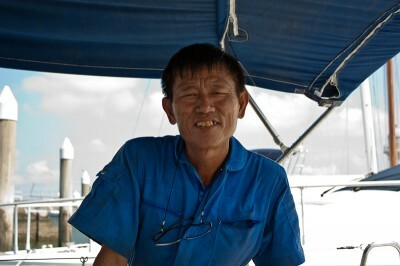 The captain still had to pay the marina’s mechanic almost a 1000 USD for the labor. The repair shop in town also had its troubles fixing the boat. And after waiting a couple more days, the repair shop gave us three choices. We could wait 6 months to get the right spare parts and to get the engine fixed properly. Secondly, we could also get the boat fixed in a week, but the engine would then have to be fixed again in a couple of months. The third option was to get the boat “fixed” within two days, but then the engine would probably die again any time (and then it would be unfixable). We had to ask the boat owner in Australia about what to do, and stupidly he decided to go with option 3. One of his many stupid decisions. Speaking of stupid decisions. Another one, was not to fill up the diesel for the trip to Bali (despite my protests). At this point I already had to accept a couple of other stupid decisions, but Toone was still the only boat I knew which went from Asia to Australia at this time. So I decided to stay on the boat anyway. Altogether we had already been waiting in Singapore for more than 3 weeks. It wasn’t really that bad though. The marina was very luxury and it was very relaxing to stay there for a while. Especially in the evenings it was nice to be on the boat, enjoying the cool breeze from the sea and a glass of Whiskey. 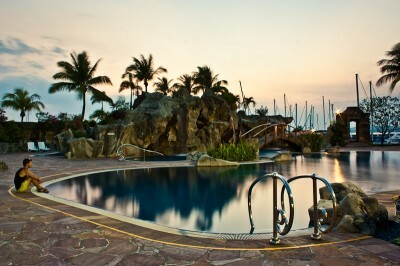 During the hot daytime it was very nice to have a big pool, where we could cool down every now and then. While waiting in Singapore we also had enough time to meet the local couchsurfing community. After one of the couchsurfing meetings I invited the Indian photo journalist Mathilda to our yacht. She really liked the boat and spontaneously decided to join us on our trip to Bali. One of her jobs is to write about little adventure trips for the Singaporean magazine “Asian Photography”, so I guess this trip was a good opportunity for her. Too bad she forgot to bring along the charger for her camera. Mithilda’s decision to join us was the night before we planned to leave Singapore. Finally, after waiting for more than 3 weeks, the engine was supposed to be kind of fixed. We didn’t really have much hopes that it would actually start this time. But then it really did. And it kept running. This was a big relieve and after one last shopping trip to the supermarket we left Singapore right away. It was a good felling to be back on the sea. However I sometimes had a bit of a nervous feeling about the engine. It was still a long way to Australia, and without engine we wouldn’t make it there (although we were on a sailing boat we still needed the engine to enter marinas and as a power generator). And of course, if you want to actually sail, you need wind. Unfortunately on our trip to Bali the wind suddenly stopped and the boat did not move one more inch. Normally you would just use the engine instead, but as already mentioned we didn’t fill up the diesel. Therefore we had no other choice than to wait for wind. For days we were stuck in the middle of the sea hoping for wind. In the end the captain even performed a shamanic wind dance to the weather god. It seems like that did it, because after 4 days (or so) the wind finally came back. Altogether the trip took us longer than expected and on the 12th day, with the last drop of diesel, we finally made it to Bali. It was a good feeling to be back on land, although for the first couple of minutes I had so called sea legs and could barely stand straight. Have a look at the galleries to see more pictures from Singapore (1/2), Singapore (2/2) and the sailing trip from Singapore to Bali.